Baikonur is the main space center used by Moscow for its activities related to the space flights. In August, Roscosmos published materials on Russia's official public procurement website, showing that the state corporation was allocating some 1.8 billion rubles on making systems' upgrades to increase the launch reliability of the Soyuz manned transport spacecraft and rocket complex as well as the Progress cargo spacecraft. 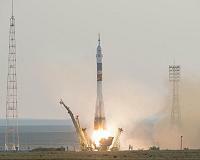 "TsENKI and Roscosmos have concluded three contracts to modernize the complex of Baikonur. Particularly, TsENKI will modernize the launch, technical and measuring complexes at the space center. A total amount of the contracts is about 1.8 billion rubles," the statement said. According to the statement, the specialists from the TsENKI should modernize infrastructure used for production, storage and transportation of propellants, among other issues. Baikonur is the main space center used by Moscow for its activities related to the space flights. At the same time, Russia has been constructing Vostochny in country's Amur Region since 2012.